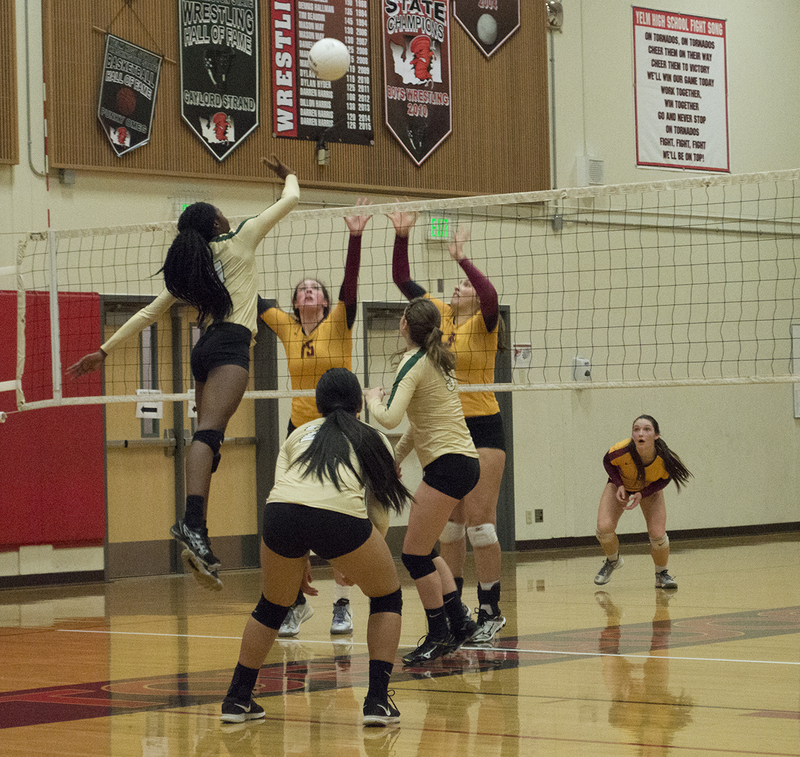 Timberline's Daja Togiola goes up for the kill against Capital. Both teams advanced to the Class 3A state tournament. Photo credit: Grant Clark. Capital High School is heading back to the Class 3A state volleyball tournament for the first time since 2014, but the Cougars will not be making the trip to the Tri-Cities alone as fellow 3A South Sound Conference members Timberline and North Thurston also secured state berths. Capital punched its ticket to state by finishing second at the 3A West Central District/Southwest tournament. The Blazers finished third at districts, while the Rams picked up fourth place as the top four finishers hailed from the SSC. Capital’s Tia Grow (#6) celebrates a kill against Timberline at the district volleyball tournament with teammates Devyn Collins (#4) and Elise Meath (#5). Photo credit: Grant Clark. The top five teams from the district tournament secured state berths. Gig Harbor, the SSC regular season champion, defeated the Cougars in straight sets to earn the district’s top seed. 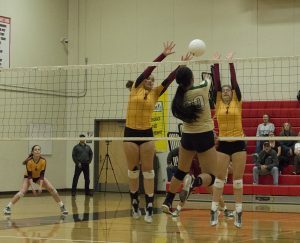 Prairie, champions out of the 3A Greater Saint Helens League, claimed the fifth and final spot. The 3A state tournament, which will be held at the Toyota Center in Kennewick, will take place November 10 and 11. The newly-formed South Sound Conference flexed its muscles through the first two rounds of districts as the semifinals was solely made up of teams out of the conference, leaving the remaining teams from the Greater St. Helens League and Pierce County League fighting it out through the consolation bracket for the last state slot. 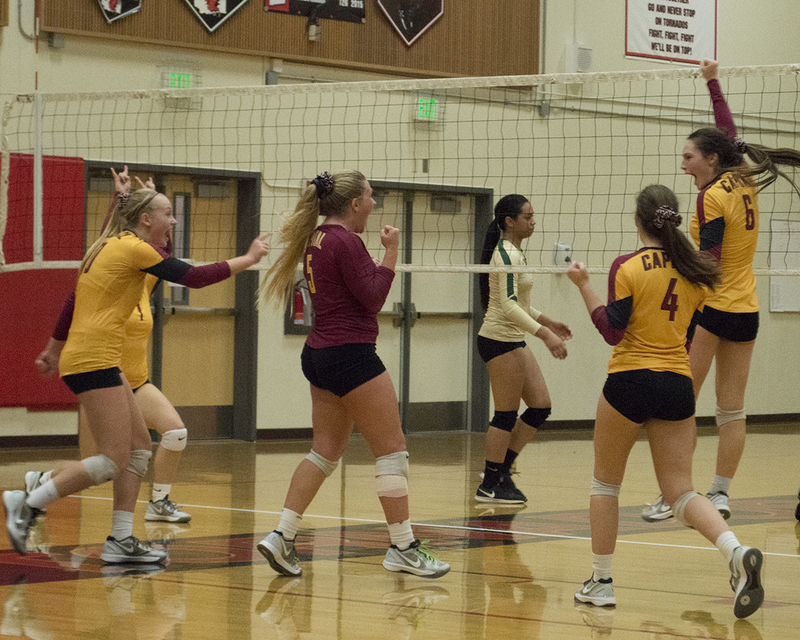 The Cougars (14-4) swept Stadium in the first round, then disposed of PCL champion Bonney Lake in similar fashion. Timberline’s Daja Togiola goes up for the kill against Capital. Both teams advanced to the Class 3A state tournament. Photo credit: Grant Clark. 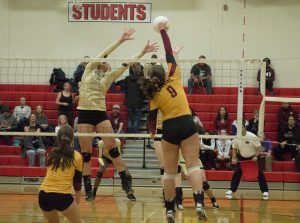 In the semifinals, Capital knocked off Timberline by completing its third consecutive sweep. The Cougars defeated the Blazers twice during the regular season, needing five sets to post the win in the first meeting and four sets in the rematch. 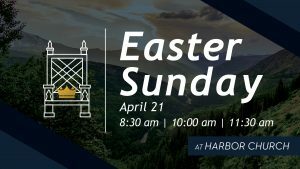 Capital’s winning streak came to a halt in the finals, losing to Gig Harbor, which has handed the Cougars three out of their four losses this season, 25-20, 25-17, 25-15. Freshman Maia Nichols and sophomore Betsy Knutson-Keller paced Capital with nine and eight kills, respectively, against the Tides. Tia Grow directed the offense, registering 22 assists and fellow junior Elise Meath led the way with 24 digs. Capital senior Hali Ehresmann (#9) helped the Cougars to a second-place finish at the 3A West Central District tournament. Photo credit: Grant Clark. The Cougars open state play against Holy Names Academy (12-10). Holy Names is making its first state appearance since finishing second in 2013. After making six straight trips to state, Capital failed to advance the past two seasons. The Cougars were 3A state runner-ups in 2014, losing to Auburn Riverside, and the second-place finishers at the 2A tournament in 2013, falling in the finals to Burlington-Edison. Before losing to the Cougars in the semifinals, Timberline dispatched Lincoln in the first round and Prairie in the quarterfinals. Timberline’s Kasey Louis attacks the net against Capital. Photo credit: Grant Clark. The Blazers (13-5) rebounded from its loss to Capital by defeating North Thurston (11-7) in four sets (17-25, 25-20, 25-14, 25-15) to wrap up the No. 3 seed. 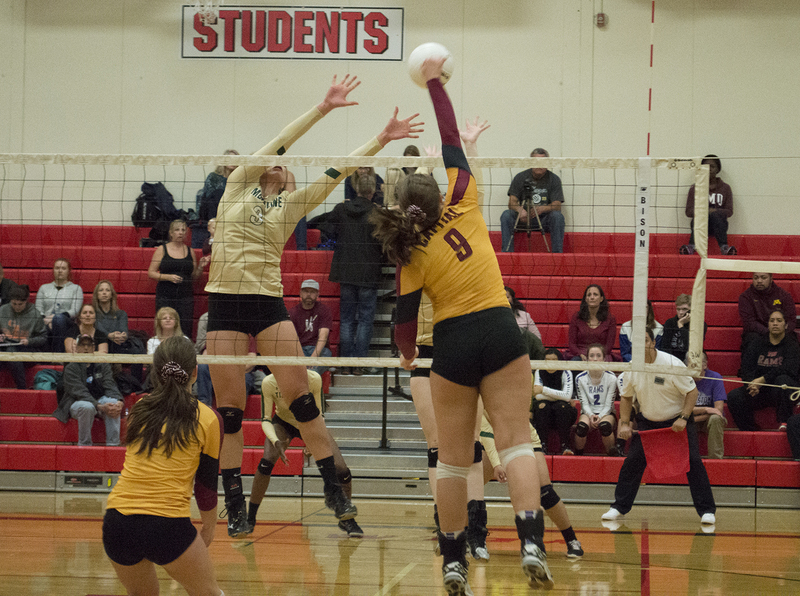 Julianna Salanoa finished with 14 kills for Timberline, which also received 34 assists from Natalie Stark. The Blazers, who moved back down to 3A this season after playing previous two in the 4A ranks, last made the tournament in 2013 when they finished seventh, the highest placing in program history. Timberline opens state against Shorewood (10-10). 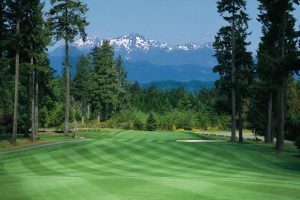 North Thurston, which placed seventh in 2014 at state and was the runner-up in 2012, breaks its brief two-year state drought. Undefeated and top-ranked Tumwater will be the team to beat when it begins Class 2A state tournament play at Saint Martin’s University. The Thunderbirds (18-0) wrapped up the 2A Southwest District championship by defeating Ridgefield in five sets. The T-Birds’ resume is loaded with credible wins this season. Tumwater opened the year by defeating defending 4A state champion Curtis, last year’s 4A state runner-up Emerald Ridge, and Bellarmine Prep, which captured back-to-back 4A titles in 2013 and 2014, before winning all 10 of its EvCo matches without surrendering a single set. The T-Birds have placed in the last five state tournaments, including fifth last year, and are looking to win their third title.